Telefonica approached us seeking help with their Spanish gender pay gap communications, following a new law being passed requiring Spanish companies to report their figures by the end of February 2019. 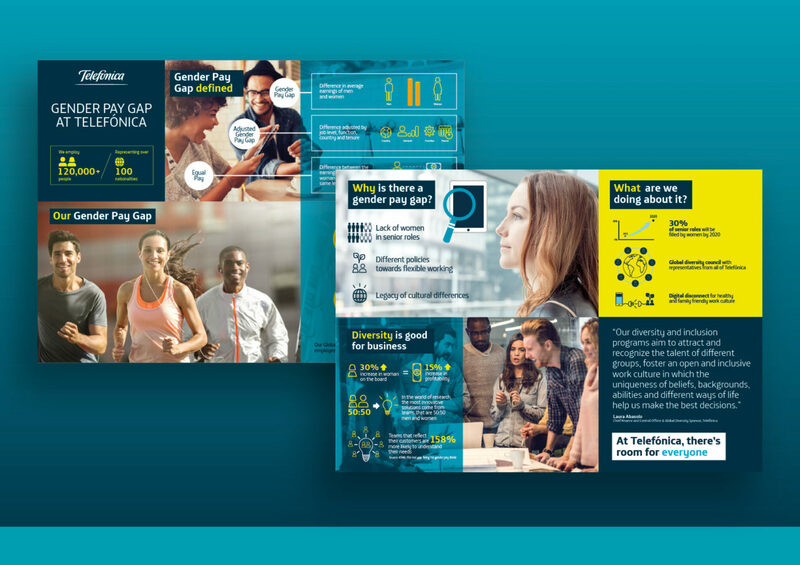 We produced a 2-minute animation (in both English and Spanish) to communicate the results to Telefonica’s employees, as well as a global version outlining the results and an infographic to complement these, which could be shared with employees and the press. The Brief: Having been impressed with the gender pay gap “know-how” Stitch demonstrated at the ProShare Conference in December 2018, Telefonica, the international telecoms giant, got in touch to ask for help with their Spanish gender pay gap communications. In line with other countries, a law has been passed requiring Spanish companies to report their annual gender pay gap figures by the end of February. They wanted to ensure their employees understood the difference between the gender pay gap and equal pay, communicate the results and highlight actions they plan to take to improve the results going forward. The Challenge: Given the size of Telefonica’s presence in the global telecommunications industry it was clear that there would be media interest in their gender pay gap results. Therefore, it was imperative that we were able to communicate the company’s figures to their employees in a clear and engaging manner as soon as they were available, and certainly before they started appearing in the press. Given they have employees across the whole of Europe and the Americas this was no mean task. The Solution: As gender pay gap reporting was a new legal requirement in Spain, we started by running an introductory workshop with Telefonica. At this session we mapped out what content was required and clarified their objectives, messaging, channel preferences and a timeline. 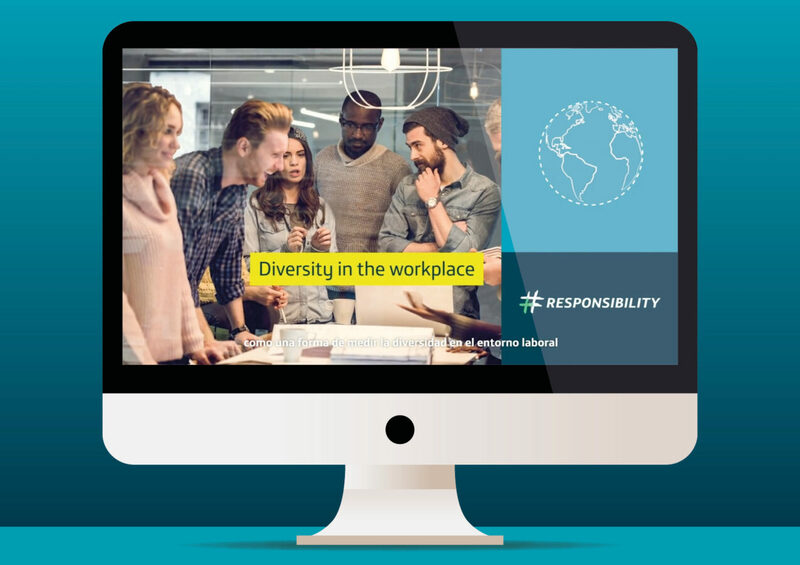 It was decided the best way to engage the largest number of employees was to create an uncomplicated 2-minute animation explaining the importance of diversity in the workplace, the method used to calculate the gender pay gap and the detail of what those figures mean, what the problems are and how Telefonica intend to address them. Simple graphics were used to illustrate the findings along with an upbeat mix of workplace and lifestyle imagery which utilised a parallax effect to emulate movement. The animation was produced with both an English and a Spanish voiceover and this served as the main piece to explain the gender pay gap to employees. 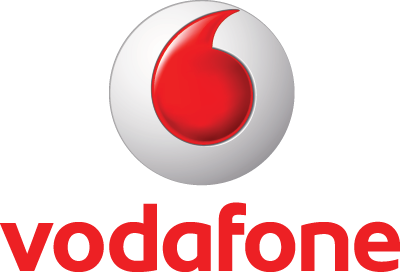 A separate global version of the animation was produced along similar lines, outlining the Telefonica Group results in order to remain as transparent to employees as possible. An infographic was also created as a one-page digital alternative to the animation which could be easily shared with employees and the press alike. This was also used as a digital asset in online discussions as it contained all the key information and graphics from the animation. The consistent narrative used throughout ensured it would be straightforward to create additional country versions of all assets as required. Outcome: Telefonica now have a clear global narrative to use with their gender pay gap reporting in future. By taking such a proactive approach to communicating their results they have successfully demonstrated themselves to be an honest and transparent organisation. We received an overwhelming amount of positive feedback from the Telefonica team who are keen to continue working with us to maintain an open narrative around the gender pay gap as well as other areas of diversity and inclusion.